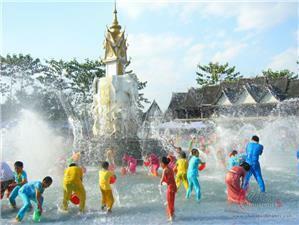 The Water Splashing Festival is an important festival of Dai minority. The annual Water Splashing Festival of the Dai ethnic minority falls during the New Year celebrations of the Dai Calendar. It is the most important festival observed by the Dai ethnic people of Xishuangbanna Prefecture, and, similar to neighboring Thailand&apos;s Songkran Festival, it involves three days of celebrations that include sincere, yet light-hearted religious rituals that invariably end in merrymaking, where everyone ends up getting splashed, sprayed or doused with water. The festival lasts for three days. The first two days&apos;s activities are concentrated on the banks of the Lancang River. On the first day, a grand celebration marks the beginning of the festival. An out-door market is set up, where locals go for new year shopping. It is also a great place to purchase local souvenirs. Local food and snacks are other highlights traveler may not want to miss. Artists create sand cavings on open space close to the market. A dragon boat race is held on the Lancang River to ring out the old year in the afternoon. At night, the banks of the river are colorfully lit, and locals float river lanterns on the river. Floating river lanterns is an old tradition in China, which is still preserved in many cities today. The practice is thought to drive bad luck away and bring good luck. The third day, the climax of the festival, is reserved for water splashing. On that day, the Dai put on their newest and best clothes, then assemble at the local Buddhist temple, where the monks chant Buddhist scriptures. Afterward, a symbolic water splashing ritual is enacted whereby a Buddhist statue, with pomp and ceremony, is first coaxed out of the temple to the courtyard, then is splashed with water. This important ritual is called &apos;Bathing the Buddha&apos;. The completion of the &apos;Bathing the Buddha&apos; ritual serves as the signal that encourages ordinary mortals to themselves engage in mutual water splashing. Accordingly, people flock to the streets with pots, pans, bottles, or whatever, where they uninhibitedly splash, spray and douse each other with water, with the same gusto with which Westerners engage in a good snowball free-for-all. The Water Splashing ceremony, however, is more than just good-natured fun; it also contains a religious element: water is regarded by the Dai as a symbol, firstly, of religious purification, but also of goodwill among people. Therefore, splashing a fellow human being with water during the Water Splashing Festival, whether a close neighbor or a fellow villager, or even a stranger, is an expression of the desire for good luck and prosperity to that person. For the tourist interested in interacting directly with the Dai ethnic minority of Xishangbanna Prefecture in an informal and fun-filled manner, the annual Water Splashing Festival that takes place in the month of April is the perfect occasion. 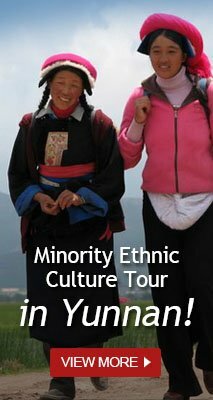 See famous ethnic festivals in China.